Last weekend, we took a trip to eastern PA for N2's First Communion. SP is N2's godfather, and we only get to see EPAS and her family 1-2 times a year, so we definitely wanted to make the trip east. It's a bit over a 5 hour drive and during that time, I got SP to listen to Lady Gaga! I figured we needed some music to keep us awake on the turnpike, give us some energy. I also wanted to see his reaction when Lady Gaga came on (I was in charge of the MP3 player, which happened to be mine so it was all 'my' music, so SP was at my music mercy!). Don't worry - I am a nice wife and I didn't torture him too much, just maybe 6 songs, and then I picked something he liked. I think he kind of enjoyed the Gaga, though he'll never admit it...! Tucked away safely & securely on the backseat were cookies we baked for the weekend. EPAS asked us to make some biscotti, so we did. 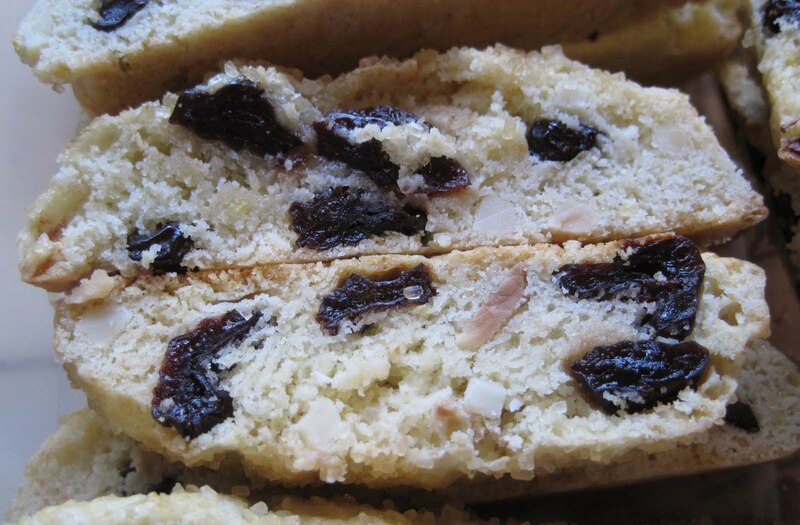 We made the same Dried Cherry & Toasted Almond Biscotti we made at Christmas time. These biscotti again turned out soft for us, which is fine since then you don't have to dunk them. I think I've decided that homemade biscotti can definitely be dunked, but are not hard enough to need dunking (this is according to my personal definition of hard enough to need dunking) whereas bakery bought/store bought biscotti (from a coffee shop or Enrico's Biscotti) are harder, crisper and need dunking. At least that's what I think. Then again, I cannot/don't like biting through harder foods while SP can chomp his way through just about anything. 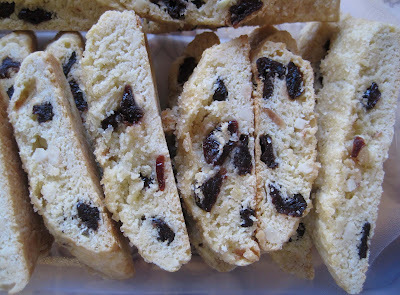 EPAS' in-laws were there last weekend, too, and her MIL made biscotti as well. Hers were also not so hard as to require dunking. And they were tasty - chocolate chip with chocolate drizzle and chocolate cranberry biscotti. I love biscotti and I was in biscotti heaven last weekend. 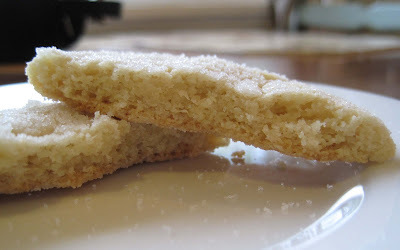 SP & I decided to also make a sugar cookie because we figured the kids wouldn't like our biscotti. 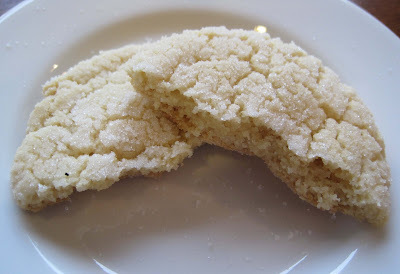 We used a sugar cookie recipe from Cook's Illustrated, I think the December 2010 issue. It uses a bit of cream cheese in the dough - yum! These are easy to make. They are softish, and chewy in the middle. In addition to the sugar in the dough, the scoops of cookie dough are rolled in sugar, then flattened a bit with the bottom of a glass, and then sprinkled with more sugar. Yikes! All the sugar coating makes these a little messy to eat since sugar gets all over your shirt and fingers. 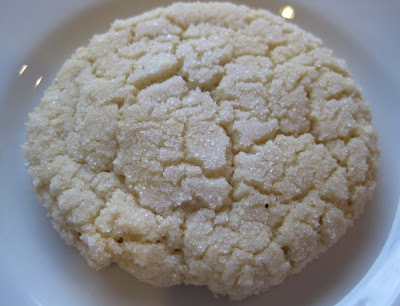 I like these drop sugar cookies, but I think I like rolled/cookie cutter sugar cookies better. We didn't exist solely on cookies all weekend (though I could have!). I didn't take any photos, but EPAS and her husband fed us quite well. Upon arrival Saturday afternoon, there were lots of cheeses and cold cuts and lettuce and tomato for sandwiches. Ham, turkey, buffalo chicken, and salami. American, provolone, and Swiss cheese. Yum! After the First Communion service - and I should say here that our 10 year old and 8 year old nephews looked so handsome in their suits & ties - EPAS and her husband served us a lovely salad and made pasta with meatballs. These were the BEST MEATBALLS EVER. I am not kidding. Usually all beef meatballs can get kind of dry, maybe taste kind of bland, which is why I usually like to combine ground beef with ground pork for meatloaf/meatballs. These meatballs were all beef and were super moist, easy to cut with the side of a fork, and flavorful. I think EPAS said the secret was pulsing white bread and milk in the food processor then adding it to the meat. Delicious! I cannot wait to try making these. And, much to my relief, they served penne pasta, not spaghetti/angel hair. I love spaghetti/angel hair, but I always make a mess of my face and shirt when I attempt to twirl red sauce covered spaghetti strands and get it into my mouth. So I was happy to have a neater pasta to eat! After dinner there were more cookies plus a tasty cake. We waddled back to the hotel and Sunday morning, went back to EPAS' for brunch. Breakfast burritos! There were scrambled eggs, sausage, bacon, cheese, salsa, and burritos. I nearly forgot to mention EPAS' tasty pumpkin roll! We had some of that for brunch, too. And lots of good coffee. And then in the early afternoon, SP rolled me into the car with a doggie bag of biscotti clutched in my hand and we headed home. It was a very nice weekend. The food was plentiful and tasty, but most of all it was wonderful to visit with family and see N2 have his First Communion. Here's my "secret": for each pound of beef, pulse 4 slices of bread, 2 eggs, and 1/4 cup water in the food pro. Eliminates nasty bread chunks in the meatballs, and they're always super-moist and tender. Then must also simmer in sauce a minimum of 4-6 hours. Love making these!